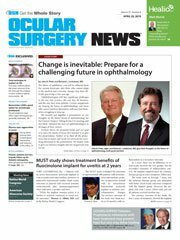 Recently, I have predicted that telemedicine is poised to become more routinely used in our management of age-related macular degeneration patients. We know that in order to make a significant difference in a patient’s quality of life, we must detect the progression from dry AMD to the wet form of the disease immediately after conversion. I have incorporated home monitoring with the ForeseeHome (FSH, Notal Vision) adaptive preferential hyperacuity perimetry test into my management plan for AMD to help preserve my patients’ vision and quality of life. Patients in the intermediate stage of dry AMD do not typically convert to wet AMD when they present in the clinic for follow-up appointments, and therefore telemonitoring gives me the ability to monitor and protect their vision between scheduled visits. Telemonitoring with the device to detect metamorphopsia associated with choroidal neovascularization (CNV) in at-risk patients was validated in the AREDS2-HOME study. The study randomized 1,520 patients to test their eyes daily with the FSH along with standard testing vs. standard care alone (this was based on the investigator’s preference, usually routine visits, Amsler grid testing and self-reporting symptoms). In the group using FSH at the recommended frequency, at least twice weekly, 94% maintained 20/40 or greater visual acuity at the time CNV was detected compared with 62% of patients assigned to the methods of standard detection. The HOME study was stopped at the interim analysis because patients using FSH demonstrated significantly better vision at CNV detection compared with standard care alone, and thus patients from the control arm were offered use of the device. The FSH is the only remote vision monitoring device with FDA clearance, Medicare coverage and level 1 scientific evidence. A review of the clinical data confirms that visual acuity at the time of wet AMD diagnosis strongly predicts visual acuity after 1 and 2 years of anti-VEGF treatment. A meta-analysis by Liu and colleagues, however, estimated that patients had wet AMD on average for 7.7 months before entering clinical trials. The duration of exudative disease determines CNV lesion size, which in turn correlates with visual acuity. With early detection comes smaller lesions, which typically correlates to better visual outcomes. A further look at the data reveals that in the clinical trials, relatively few eyes with CNV were detected when visual acuity was still relatively functional (ie, driving vision), 20/40 or greater. In fact, only a small group of patients begins with functional vision. This significant gap provides us as retina specialists with an opportunity to catch the disease earlier to preserve vision. Using data from the American Academy of Ophthalmology’s IRIS Registry, which analyzed more than 160,000 eyes, Ho and colleagues performed a real-world retrospective cohort analysis to characterize visual acuity upon diagnosis of new-onset wet AMD.